A complete fresh tool developed from scratch; inspired by existing tools available out there. 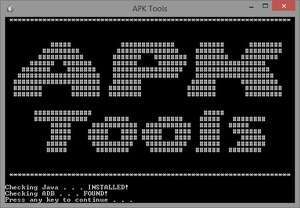 APK Tools works with Android phones and makes it easier to do development or rooting work with your phone or tablet; Easy-to-use graphical user interface. A complete fresh tool developed from scratch; inspired by existing tools available out there. Version 3.50 is a freeware program which does not have restrictions and it's free so it doesn't cost anything. For security reasons, you should also check out the APK Tools download at LO4D.com which includes virus and malware tests. Additional screenshots of this application download may be available, too.